THE DEPARTMENT OF CONSERVATION at Gothenburg University in Sweden has on the one hand a branch called The Crafts Laboratory, situated in Mariestad, some 170 km’s northeast of Gothenburg, dedicated to education and research in crafts within the heritage practice field, established in 2010, as a joint resource between mentioned department and public bodies on governmental, regional and local levels, with the objective to preserve and develop craft skills and craft research within the heritage practice field (quote from their web site). As regards architectural conservation problems: decay and damages of built heritages in Ethiopia, i.e. round churches constructed by clay, straw and wood, as well as the rock hewn churches, dug out from the bed rock, this crafts laboratory can in the long term development of SCECH’s activities be of great importance for our project in Ethiopia. On the other hand the Dept of Conservation has, besides various kind of educational programs in conservation, a research capacity in conservation and methodologies connected to this and through investments in laboratory resources at the department, and in cooperation with other departments at the University of Gothenburg as well as organizations outside the academia, a […] competence […] within the internationally established field of conservation science (quote from the same website). Tailored in order to serve the specific need for education and research within this field in Ethiopia, this potential capacity of know how can be of great importance for our planned long term program of conservation, education and research and as a backup for our field workers. 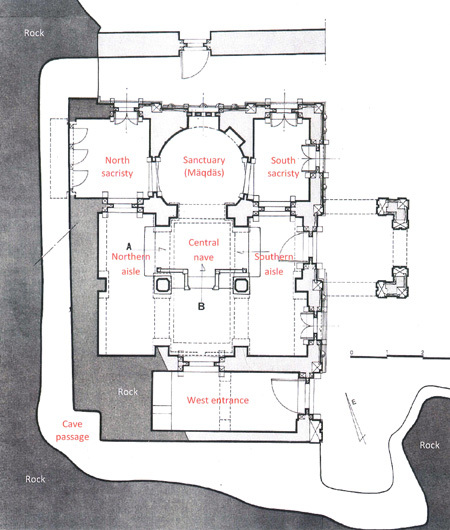 The ground plan above describes the early medieval church of Debre Selam Mika’el – a gem among the ancient Ethiopian churches – dated by David W. Phillipson, Professor in African Archeology, to between the 8th and 11th century (Phillipson, Ancient churches of Ethiopia, China 2009, p. 186). It is partly built in so called Aksumite style and partly rock hewn and situated on the Atsbi plateau in Tigray, the northernmost region in Ethiopia. The walls, pillars and apse are adorned with the presumable oldest (still) persevered murals in Ethiopia, however in accelerating decay. Here SCECH’s conservation team did a prelimininay ocular and technical examination 2010. 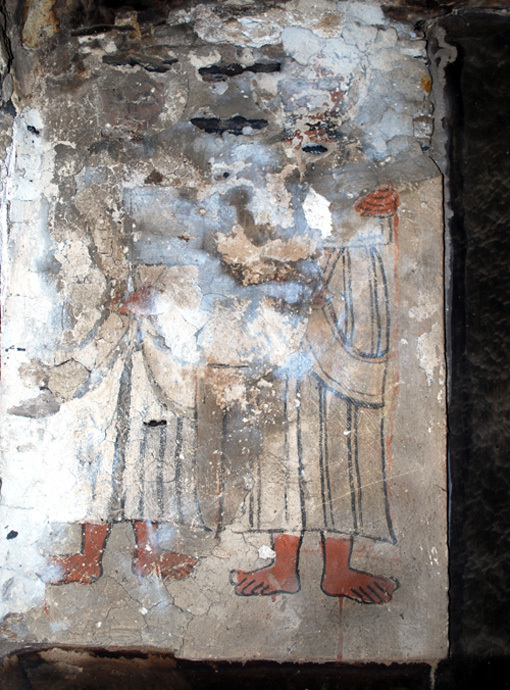 This is just one example of ancient Ethiopian rock hewn churches with wall paintings in alarming decay, were the know how of the Dept of Conservation in Gothenburg in architectural conservation and conservation science and tailored methodologies could be of invaluable use. 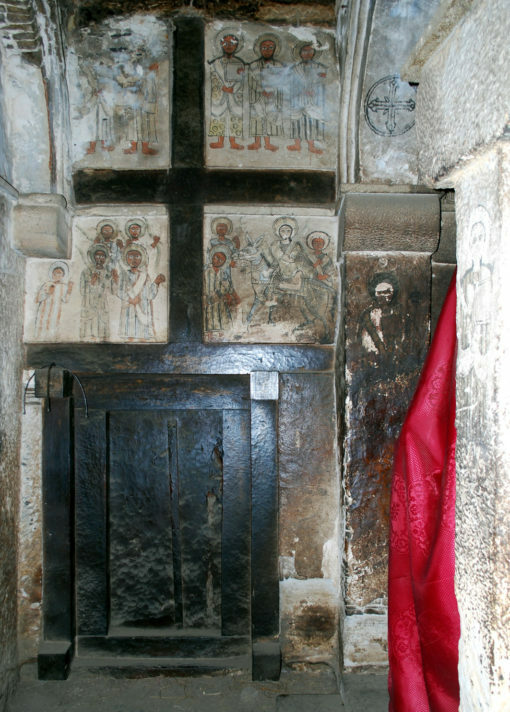 In the photo above we see an interior of the northern aisle of the church entirely cut out from the bedrock, and the four murals that adorn the eastern wall here is, besides the rest of the pictorial program of this church, presumable the oldest preserved paintings in Ethiopia. The two photos below show close ups of on the one hand a mural still in fairly good condition, depicting three unidentified saints seen to the upper right of the four motives, on the other another hand, to the upper left, a highly deteriorated mural, depicting two unidentified saints, which is in an alarming state of decay, pulverizing, due to salt in the cliff wall and the plaster on this one. To solve the conservation problem in the latter is something that probably could be a challenge for a researcher in material based conservation science at the Dept of Conservation in Gothenburg by his own and in discussion with SCECH’s conservation team, or if necessary extended to a joint research work in collaboration with another institution, specialized in problems connected to plaster. 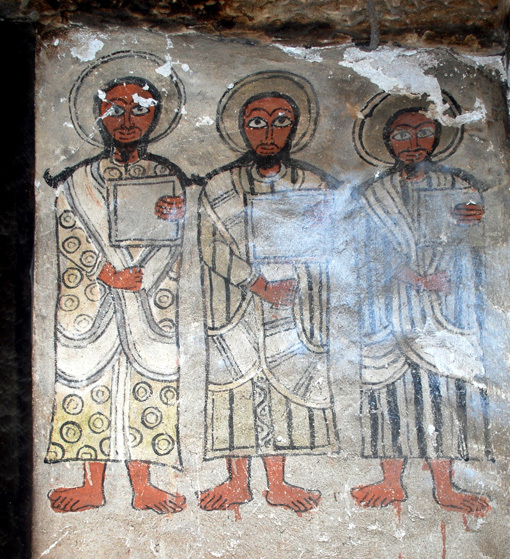 The problems of architectural and painting conservation are, as in the case of this and many other churches in Ethiopia, often interlaced. The know how and professional capacity of this department and its branch in Mariestad and with the national and international network connected to this field they are able to consult, is not least as to architectural conservation, of great potential importance for us in SCECH in our ambition to by conservation and research assist in the battle against the decay of the Ethiopian cultural heritage. The Department of Conservation at Gothenburg University has a collaboration with the? Swedish National Heritage Board, the equivalent of Ethiopia’s Authority for Research and Conservation of Cultural Heritage (ARCCH). The Head of this department, Professor Bosse Lagerqvist, and one of the researchers here, Dr. Jacob Thomas, are members in SCECH. The backup of this institution and its crafts laboratory, with their capacity to tailor research and recommend conservation methodologies for our field workers, should not be underestimated. In addition they also have the ability to make advanced analyses of color pigments and binders, as well as staff skilled in how to use advanced high-tech equipment in order analyze buildings as well as painted surfaces, useful know how with regard to our wish to developing conservation techniques tailored to the specific problems of decay of the ancient buildings and paintings in Ethiopia. As to SCECH’s ambition to assist in a long-term development of education in conservation in order to create a domestic profession of restorers in Ethiopia, Professor Lagerqvist has sketched a first tentative curriculum for a long-term development of higher education in conservation in Ethiopia, including doctoral studies, which opens for domestic research in conservation, based on the concept of how graduate education use to be organized internationally. It was created to serve as starting point for a discussion with our colleagues at the Ethiopian Universities about what possible could be done in the long run and was at our workshop together with colleagues in Ethiopia presented by Dr. Jacob Thomas in May last year at ARCCH’s headquarter in Addis Ababa. This has resulted in an exchange of curricula with The Ethiopian Institute of Architecture, Building construction and City development (EiABC), a branch of Addis Ababa University. A wish to collaboration with us here in Sweden from Weldiya University has also been expressed on account of a branch dedicated to graduate education in conservation and heritage management, which this University will open in Lalibela in October. The Gothenburg University Department of Conservation will organize a workshop in Gothenburg on the relation between ’Scientific methods of conservation’ and ’Peoples based conservation’, possibly in collaboration with University College of London UCL. This will take place in September this year and to this workshop we hope we can invite a few Ethiopians with academic training, preferable from mentioned universities.